Arthur Curry has been the punchline of too many jokes. 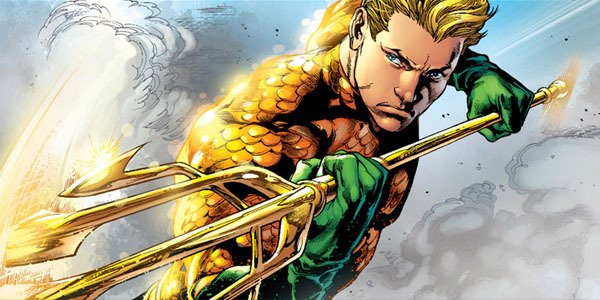 Let the truth be known: Aquaman is awesome. Over 70 years ago, a couple of comic book creators by the name of Paul Norris and Mort Weisinger created an unlikely hero: he could breathe underwater, communicated with sea creatures, and was closely tied to a secret, undersea city that may or may not have been Atlantis, depending on which origin you read. Because his genesis took place during the conflict of World War II, it makes perfect sense that Aquaman spent his early years fighting for freedom and against the likes of Nazis. In the decades after WWII, he was a charter member of the Justice League, and in more modern times has struggled with a heavy crown in his attempt to lead his people with a fair hand while fighting off usurpers and threats from below. Though his origin has changed as much as the tide, he's consistently been a three-dimensional character with motivations that made him very human. Not everyone seems to think so. It's become cool to pick on Aquaman, but I'm not sure where all the jokes come from. I know Family Guy took a shot or two, and that seemed to have resonated in the zeitgeist, lowering Aquaman's status from a peer of Superman and Batman to the level of a janitor who cleans up the bathrooms in the Justice League Satellite. Yes, he hangs out underwater. Yeah, he wears a sparkly orange shirt. Yes, he talks to fish, but I prefer to say "commands the vast armies of the depths." Okay, so maybe Aquaman is no Superman and he's no Batman. He doesn't have cosmic power from a green ring, nor can he run faster than anything alive. This does not make him lame. This makes him interesting. I've always appreciated Aquaman. I remember when I got his Super Powers action figure in the early '80s. One of the cool things about toys from that era is that they often came with little comic books that furthered the package value and fueled your playtime adventures. The Aquaman comic had a condensed version of his origin story, and it fascinated me to no end. I've always been both drawn and afraid of the ocean, and I read and re-read that little comic, which, in my memory, captured the melancholy nature of the open water--its loneliness and the freedom--all in just a few pages. I read Aquaman comics when I could, but I didn't have a ton of money, and what I did have was going to G.I. Joe comics and toys during those years. 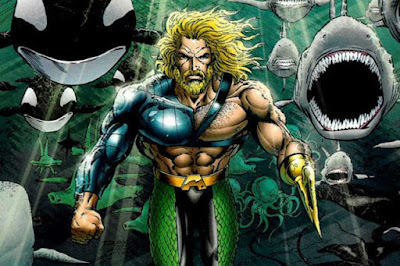 Fast foward to the 1990s when I had more money and writer Peter David (who ruled Hulk comics for years) was the writer on a relaunched, fifth series of the Aquaman comic title, transforming Arthur from a clean cut fish-kisser into a long-haired underwater biker with a harpoon for a hand. What can be said about this other than that it was the '90s and that's exactly what comics like back then. Characters spoke as little as possible and struck awkward poses, usually with guns as big as a telephone pole. Because I was a teenager when all this was happening and thus highly impressionable and looking for rebellious heroes, I will always have a soft spot for the trashy, obnoxious comics of the early-to-mid-'90s, and I'm proud to own a full run of this volume of Aquaman. It gave me something that felt true to the stuff I enjoyed as a kid, but updated for the place and time I was living in then. This iteration of the character also eventually spawned a Gamecube video game that I haven't had the chance to own or play, but it's something that I need to get around to doing, even though opinions of it are lukewarm at best. In more recent days, Geoff Johns, another life-long fan of the character, wove Arthur into his "Blackest Night" and "Brightest Day"Green Lantern stories, and eventually spearheaded the New 52 relaunch of the Aquaman title, seemingly with the intention of legitimizing the character for jaded mainstream audiences. 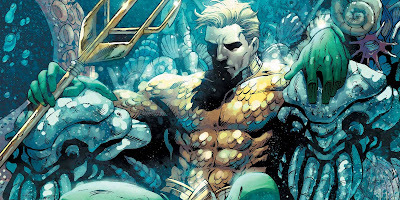 The book tackles head-on several of the misconceptions and talking points that are often used to pick on my man AC, dispelling and refuting them in an attempt to establish Aquaman as deserving of belonging in the pantheon next to the rest of DC's heavy hitters. His fishy-ness has also popped up in tons of media over the years. Starting back in the 1960's when he shared top billing with the Big Boy Scout in Blue for The Superman/Aquaman Hour of Adventure, getting his own half of the show. He appeared on Super Friends, as well as the various Justice League cartoon series from Bruce Timm, and even on Smallville. There was a failed Aquaman television pilot, and finally, a version of the character that most resembles the Peter David Harpoon Biker popped up in Batman v Superman: Dawn of Justice and will be getting his own movie...well, maybe. I kind of hope he doesn't, but that's for another time. Look, cards on the table: I really don't get how anyone could actually consume an Aquaman story and not care about the character. It's easy to make fun of him from a distance because the fish puns are just too obvious, but when you read an Aquaman comic or watch him in one of the many compelling animated adaptations, it's awfully hard not to appreciate the inherent coolness of a guy who has the bearing of royalty but isn't afraid to get his hands (er...harpoon) dirty. Plus, the creators, Norris and Weisinger, recognized the mystique and danger of the open sea; it's a dangerous, deadly place that we have barely begun to explore. We talk about space being the final frontier, but our own planet has as much mystery as the farthest reaches of the galaxy, right here in the depths of our oceans. It's not uncommon for a creature to wash up on shore or to get snared in a net, miles from shore, later to be tagged an animal that science knew nothing of. The sea has always been the setting for some of our greatest adventures and tragedies, going all the way back to Beowulf. It's why Pirates of the Caribbean continues to appeal to boys and girls of all ages and why Treasure Island will always be one of the greatest adventures in literature. Aquaman slots right into this mysterious setting and gives us a hero who fights for justice and humanity, but he does it from the depths of the abyss. He does it for himself, but he also does it because it's the right thing to do. His foes aren't just villains mad with power, or humans who seek to spoil and pollute his home, but the very forces of nature, as well. There's an awful lot of open water to explore. Now tell me, what's cooler than that?